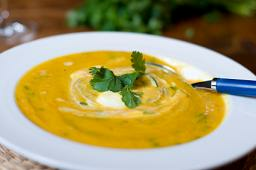 Try this Curried Carrot Ginger Soup Recipe – it is delicious, nutritious and very easy to cook. 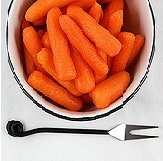 The carrot and ginger soup is low in calories and fat and you can enjoy it with crusty wholemeal bread. This Curried Carrot Soup can be served as warm or cold carrot soup. Recipe Nutritional Profile: Healthy Weight, Heart Healthy, High Fiber, Low Calories, Low GI, Low Cholesterol, Low Saturated Fat, Vegetarian, Good Source of Vitamin A and C.
Cooking time: 15 - 20 min. Coriander leaves, chopped to garnish. Heat the olive oil in a large pan over a medium heat, add the onion and cook until the onion is translucent. Add the curry powder, ginger, carrots, parsnips, and leek and cook for a few minutes before adding the vegetable stock (add as much stock just to cover the vegetables). Cook until the vegetables are tender. Pour the content of the pan into a food processor or blender and whiz until smooth adding seasoning and freshly ground black pepper to taste and more vegetable stock if needed. Dish up into warm bowls garnished with yogurt and coriander leaves.